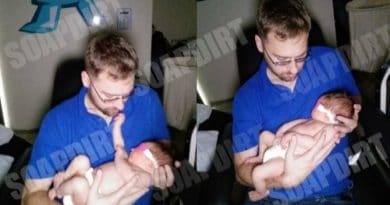 90 Day Fiance star Paul Staehle and wife Karine Martins released news pics of baby Pierre Staehle but then TLC shut them down. Paul retracted the photos, but we grabbed them before he did! The other big news to share is about Karine and Pierre’s medical status. As a first time dad, 90 Day Fiance Paul Staehle was understandably excited to share an update about his wife and son. The reality show star seemed to think he was not violating his contract with TLC by updating fans and followers when he shared info and pics. But now he’s had to pull them down. However, here’s what came out. Karine Martins’ intense labor pains began last Wednesday, March 20. On Thursday, Paul Staehle took her to the hospital but their son Pierre Staehle was not born until Friday, March 22. 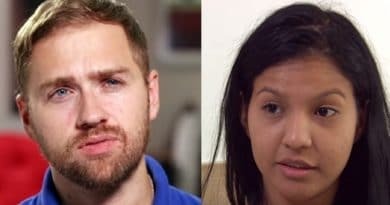 Unfortunately, Karine Martins was not given any pain meds, so she endured a grueling two days of labor without any relief while 90 Day Fiance cameras reportedly rolled. For those 90 Day Fiance fans who don’t know, an episiotomy is when they cut open your lady bits to make room for the baby’s head to come out. This procedure is performed with blunt tip scissors that cuts the flesh of the body. Without an epidural or other pain medicine, this can be excruciating but necessary in some cases to prevent tearing. In most American hospitals, the laboring woman gets an epidural to block pain from the waist down. Or they get local anesthesia before they do the cutting. Karine Martins reportedly got no pain meds at all. Of course, she gave birth in Brazil where medical studies show that episiotomies are done, often needlessly, in almost 95% of deliveries. 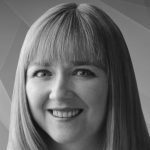 It’s too bad Paul Staehle and Karine didn’t get to the US before she gave birth or this ordeal might have gone very differently for the young mother. The good news is that Karine’s mom was with her the whole time. TLC forced Paul to delete this info, but we got that archived too. Paul shared that Karine “is a strong woman” for enduring all the pain. Reportedly, all of this will play out on future 90 Day Fiance episodes. The hospital source that leaked pics exclusively to us, also said cameras were rolling the whole time of Karine and Paul and Pierre Staehle’s birth. 90 Day Fiance hubby Paul briefly shared (then had to delete at TLC request) a photo of little Pierre Staehle getting a treatment for jaundice. Phototherapy (light therapy) treats this common condition. Paul posted a quick pic of Pierre with his tiny infant sun shades on getting in his UV rays to help with the jaundice. Karine and Pierre remain hospitalized in Manaus, Brazil, said our inside source from the hospital. It’s not clear exactly what type of spinoff this footage will appear on of Karine Martins’ labor and delivery. But the behind the scenes source at the hospital confirmed cameras in place filming everything that went down. We also got more from the source that sent Soap Dirt the exclusive labor and delivery pics. (You can see those here). The source saw professional photos being shot with Karine, Paul, and Pierre. Those could be for a 90 Day Fiance TLC blog. Or perhaps the network cut a deal with a national American magazine or website. Since mags often buy exclusive rights to pics for reality stars’ baby births and weddings. Be sure to check out all the baby pics above to see what’s happening. No doubt TLC will post more official news later. But for now, Paul Staehle has been ordered to go on social media silence!. Check with Soap Dirt all the time for more scoops on 90 Day Fiance news and spoilers.